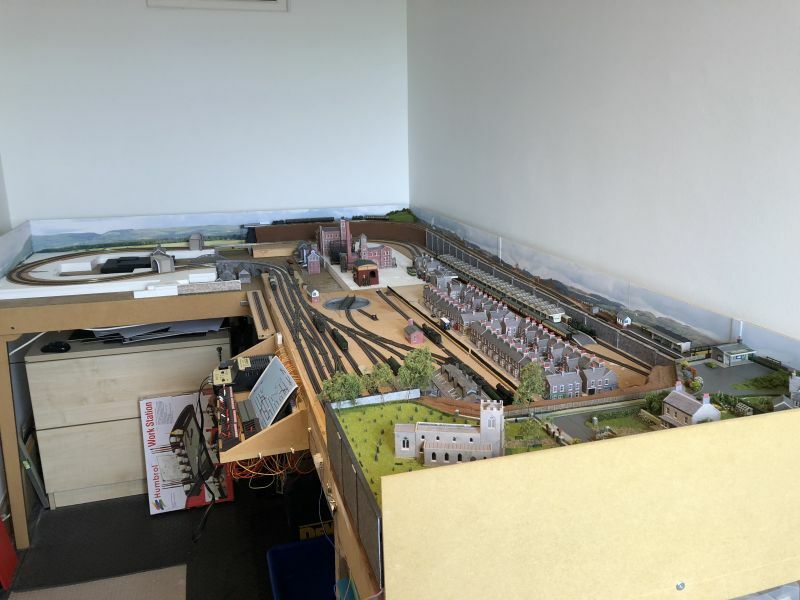 About three years ago, I mentioned to my wife that I had always wanted to have a N gauge railway layout, and as I was beginning to think about retiring a little earlier than my 60th birthday maybe finding space at some point to build one would be a good retirement project. I had built a 00 layout 30 years earlier although without much in the way of scenery. Within half an hour my wife had reorganised our 3 bedroom flat to empty everything from one of the small bedrooms but my desk. In that room I am building Elvenhome (in the image below). The layout is 2.8m along its longest side and 1.9 along the foot of the L. It is 900mm deep and stands at 1m of the ground. It is a fictional place with the names for almost everything taken from the works fo JRR Tolkien, principally Lord of the Rings. The main station is called Weathertop with three other stations, Grey Havens, Sharky's End, and eventually High Elven. It is DCC but with DC control of point motors and lights. It took about a year for me to source and have supplied the baseboards (living in a 3rd floor flat I have very little scope for major woodworking) for my L shaped layout. I have been astonished by the range of skills that you need to master. I have enjoyed the challenge of learning them and applying them. I am particularly enjoying scratch building things for the layout, mainly so far from card, so that I have things that are unique to my layout. Above all else it has proved, and is proving to be great fun. I hope you will enjoy the updates to the layout as I record them here. Here is the link to my latest video with me completing the gardens for the Gardener and Sexton to St Eldar's Church at Grey Havens. I also have a first go at building a hillside. Very nice. Do you have the dimensions? Thanks. Have to convert to imperial, this is the U.S. Note the absence of the V.
Time for the June update showing other things I have been doing in addition to gardening and scenic work. It includes my first use of Ballast Magic, with good results, and a demonstration of a gimbal that I am using with my IiPhone to get running shots. This last bit took several attempts to get it right, and I have included some outtakes of the bits that didn't make the cutting room floor. 900mm is a little over 35"
2800mm is about 9ft 2"
The trick is to work in metric rather than try to convert as I found when the changeover occurred here in mid 74. I could not believe the recalcitrance of people I met in America 2.5 years after that who could not get their heads around the metric system and subsequently dumped the idea. With the fun of August in Edinburgh over it is time to let Sharky's End get its station and to complete some more the infrastructure around it. This video follows that work. Thanks very much Brian. As we all do, I get great satisfaction in seeing the plans come together, or more often something totally unplanned work really well. Time to show the next stages in the building of the War Memorial. Finding a place for it on the layout has caused me to rethink the town plan as I explain. I also show the happy outcome to a moment of deep despair, when my soldering iron touched something it really shouldn't. At least it was only a model and you didnt burn a hole in your leg or set the house on fire Stephen. Im sure all of us have damaged or broken things in error at some point. Briperran wrote: At least it was only a model and you didnt burn a hole in your leg or set the house on fire Stephen. A lovely layout Stephen - I don't know how you N gaugers do it! I'm forever cursing how small everything is in OO! Great to see the war memorial completed before 11/11! And a lovely model. You take the same approach to problem solving as me - things that need to be planned and finished before something as simple as ballasting. Thanks very much Michael. N gauge can be a challenge sometimes. With the kiosk there were four small triangles, not more than a couple of millimetres in length to support the name board in position on the roof (you can see one of them in one of the pictures). After wrestling with two I'd had enough! Glad you like the layout which is coming along as I wanted.